Celebrate the holiday season with MCA of Chicago and your colleagues on Wednesday, December 13, 2017! 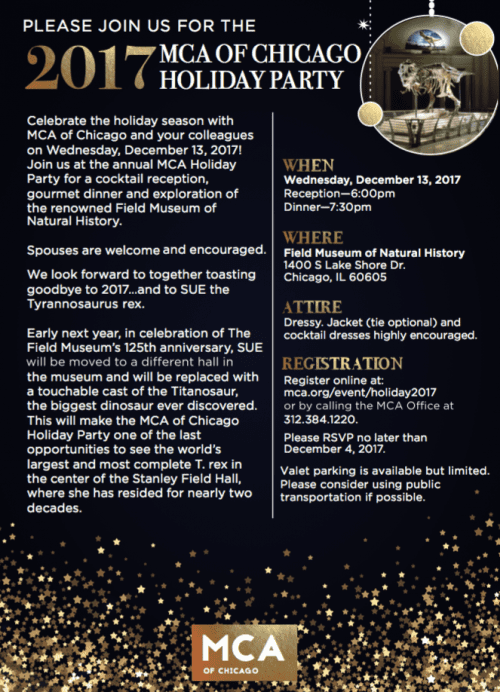 Join us at the annual MCA Holiday Party for a cocktail reception, gourmet dinner and exploration of the renowned Field Museum of Natural History. Spouses are welcome and encouraged. We look forward to together toasting goodbye to 2017…and to SUE the Tyrannosaurus rex. Early next year, in celebration of The Field Museum’s 125th anniversary, SUE will be moved to a different hall in the museum and will be replaced with a touchable cast of the Titanosaur, the biggest dinosaur ever discovered. This will make the MCA of Chicago Holiday Party one of the last opportunities to see the world’s largest and most complete T. rex in the center of the Stanley Field Hall, where she has resided for nearly two decades. Dressy. Jacket (tie optional) and cocktail dresses highly encouraged. Valet parking is available for $20 but space is limited. Please consider using public transportation or a ride share service if possible. Registration for this event is now closed. Please contact the MCA of Chicago office at 312.384.1220 with further questions.